Nothing fills Jodie Cunningham's spirit like sharing contemporary Christian music and scriptural insights on her morning drive radio show at KWJD. But lately, shes overwhelmed and depleted by family circumstances that have led her from Dallas to Angel Falls, Texas and Heart's Haven apartment complex. 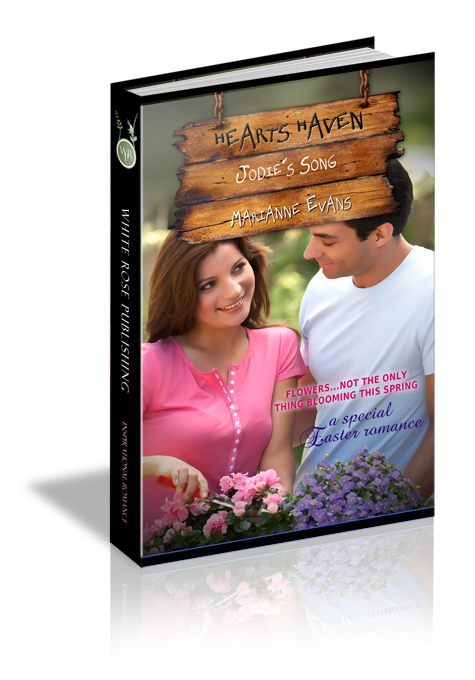 Kevin Mitchell is the groundskeeper at Heart's Haven--a place famous for angelic intercession and loving connections. His uncle owns the facility, but he's ailing. Kevin eagerly chips in, and as he prepares the grounds for a spring wedding, he meets Jodie. They begin to work together to make Heart's Haven sparkle. But just as Kevin succeeds at coaxing Jodie's heart to bloom, tragedy strikes in a double dose that tests both their strength of faith and the love they've found. Jodie Cunningham navigated her car into a corner turn, clutching the steering wheel. The final bit of roadway that led to The Falls Tabernacle stretched before her. Angel Falls, Texas. Home. Despite anxiety and the somber mood that rode shotgun, her lips twitched upward. Nothing in the rural flatlands of southeast Texas seemed to change. That was a good thing. Assuring somehow. She gathered her breath into a bone-deep sigh. Today—over the past several weeks actually—everything seemed to be changing and draining her spirit rather than soothing her soul. She shook off a black cloud of dread and blinked to clear her mind. Brow furrowed, she peered through the windshield at a site as familiar to her as daybreak, the stone edifice and soaring cross spire of Falls Tabernacle. This was where she had been baptized. This was where she had dedicated herself to Christ and met her Savior heart-to-heart. Unfolding from her low-slung sedan, Jodie stared and absorbed for a moment then pushed ahead. She focused on the click of her heels against smooth, even cement as she made her way to the doorway of the church, longing for anything that would distract from the heart-wrenching family drama set to unfold. At that point, shiver-inducing feather strokes danced against her skin, followed promptly by a spine tingle. Angel wings seemed to beat against an ominous threat that brewed into an unseen tempest. She slowed. Why did everything feel so wrong lately? Squaring her shoulders, adjusting the strap of her black leather purse, Jodie stilled her nerves. Her outlook settled once she crossed the threshold of the church. Leaving behind the outside world felt akin to releasing a live wire. Sizzles of something indefinable—but potent—instantly left her senses. Thankful for that, she automatically scanned faces until she found the ones she sought. First, she spotted her older sister. As always, Tracee and her husband and two kids—Alex and Melissa—occupied the third pew to the right. Head high, attention riveted, Tracee focused on the pastor, who was just beginning ten o’clock services. Jodie ignored the initial Scripture reading. Instead, different words crashed through her mind—the memory of her most recent telephone conversation with Tracee. Echoes from that unusually scalding reprimand left Jodie to hang her head. Heat, a mercury marker of shame and regret, inched up her body. She eyed an empty space in the rear-most pew, but for the moment remained tucked in the corner—far from her sister. Next, rather than pay attention to the start of the sermon, Jodie took in the rest of the parish members, her gaze settling at last upon her father, ensconced as always in his assigned spot as an usher. He stood straight and strong, a brass nameplate pinned just below the line of a deep blue kerchief that matched his perfectly knotted tie and lent a pop of color to an impeccable black suit. The vision of him was so timeless, so precious, it took her breath away. Mom would have been so proud…so smitten. Jodie’s hand flew to her throat where a lump built fast and thick. Their love had been so beautiful. Maybe that’s why she found it difficult to find her way to commitment. The bar had been set very high indeed. Her father had always possessed such dignity and honor, especially when it came to matters of reverence toward Christ and the church. Without a doubt, his example gave birth to Jodie’s passion for serving...and ministering. The thick tuft of gray hair, mustache, and gently weathered face were familiar, but she noticed something different in his shoulders. His posture struck her as newly frail, somewhat weaker than she recalled from her most recent visit home a month or so ago. Looking deeper, she saw strain in the lines around his eyes—strain and a layer of pain time would never erase. Not this side of Heaven, anyway. Two years without his other half, Elizabeth, had done more than age Grayson Cunningham. They had ravaged him and drained him dry. Tracee was right. The effects showed. Jodie’s gaze darted to her sister. Still, Tracee could’ve been a bit more gentle-spirited and tactful about the declaration. Her sister wasn’t generally one to snap. Fighting tears, Jodie finally tucked into the back pew, smoothing the lines of her slim, black skirt. Humidity built fast as spring came calling. Judging by the way her pink silk blouse already tacked to her warming skin, today promised to give folks an early taste of summer. Crossing her legs, she settled and continued to watch her father. Something about his demeanor puzzled her. Dignified and respectful, he manned his usher station like always, but he didn’t seem to be focused on the preacher. Instead, he stared ahead blankly, lips moving in silence while he clutched his hands into fists at his sides. Suddenly, the most awful, painful expression swept across his features. In that instant, he swayed. His chest rose and fell in a shallow, unsteady way. Just as he blinked free of whatever trance-like moment held his mind, he lifted a trembling hand to his chest—right above his tender and massive heart. Jodie let out a cry and lunged from her seat as her father collapsed.